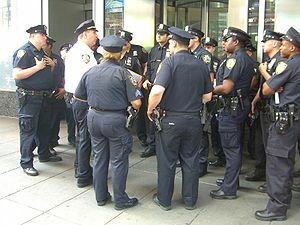 English: New York City Police officers being debriefed by their lieutenant (in the white shirt) in Times Square, May 29, 2010. 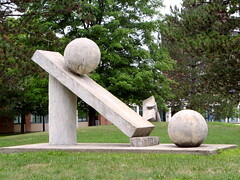 Photo by Luigi Novi. I didn’t plan to write about it again. I’d said my piece and I was going to let it go at that. Then I saw this slide show of politicians eager to arm teachers on the Huffington Post website and it made me think of these headlines. If trained policemen, who have almost unlimited opportunity to practice shooting can’t manage to use their guns safely, what on earth makes these politicians and all the other people advocating arming teachers or otherwise putting guns in school think that it will turn out well. The NRA and other gun advocates often accuse people trying to limit the amount of fire power accessible by the average citizen of having knee-jerk over-reactions to instances of gun violence. Perhaps, but that door swings both ways. It is time to put our knees back in place and start reacting with our brains instead. Everyone has too much to lose if we can’t figure out how to let sport shooters and hunters have guns, even let the average citizen have a shotgun or six-shooter while also denying anyone but the military access to automatic weapons AND keep most of us safe from gun violence most of the time.